Say goodbye to diesel woes – BG Products, Inc. When most people think of diesels, they’re reminded of smoke belching semis, smelly city buses or noisy, poorly engineered passenger vehicles. These perceptions represent actual disadvantages of yesterday’s diesel engine. In 2002, International Trucks created the 6.0 Ford Powerstroke engine with hydraulic injectors. It built a reputation as one of the most powerful performers in the light-duty diesel market, plus it’s quiet and clean! Unfortunately, the Ford 6.0 Powerstroke is highly susceptible to carbon deposits in its EGR and air intake system. In less than 20,000 miles, carbon build-up has the potential to completely plug the EGR. In addition, the high soot content of the diesel engine oil plugs the oil passages causing the injector to misfire. This aggravates existing driveability problems of rough idling, hard starting and poor fuel economy. Until now, the only way to clean the exhaust and fresh air passages was to physically remove the engine components and have them steam-cleaned. This process is costly and inconvenient and, as a result, rarely performed. 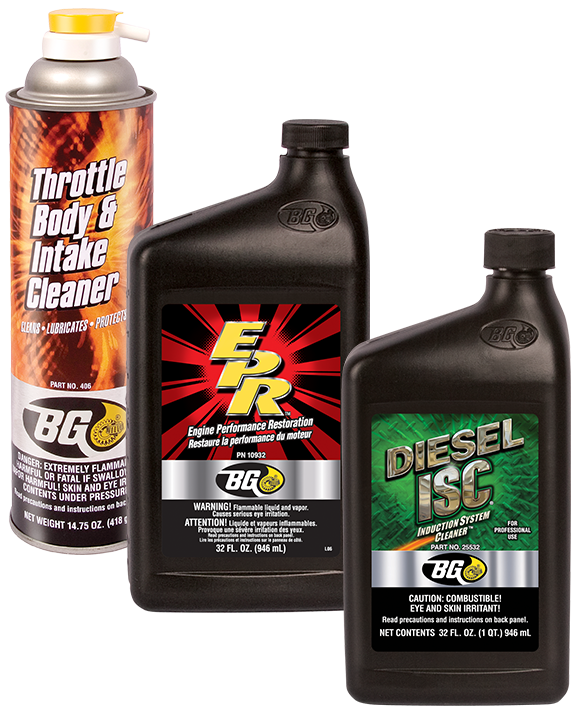 Unparalleled by any other diesel service, the BG Diesel Induction Service chemically cleans each component and completely restores the vehicle to peak performance… without engine tear down! 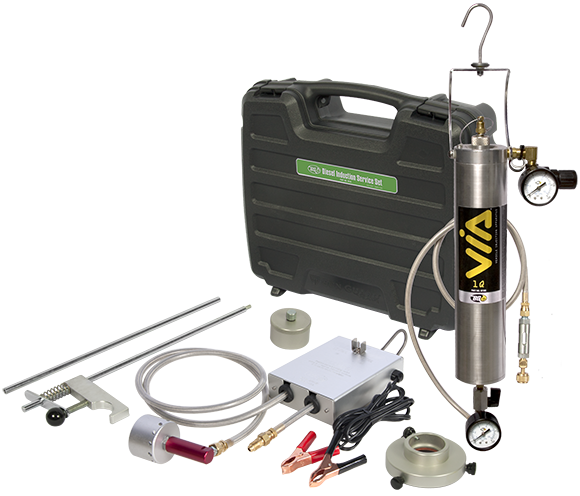 This service moves BG Diesel ISC® Induction System Cleaner,™ PN 25532, through the EGR runners and cavities as well as the air intake. BG EPR® Engine Performance Restoration®, PN 10932, is added to the engine oil while the induction service is being performed to clear the oil passages of the hydraulic injectors and restore performance. The EGR valve is thoroughly cleaned with BG Throttle Body and Intake Cleaner, PN 406. Using exclusive BG tools and products, the BG Diesel Induction Service decreases rough idle, engine stalling, hard starts and hesitation, while increasing vehicle power. As a preventive maintenance, this service is proven to decrease emissions, restore fuel efficiency and engine performance. The release date for this tool set is scheduled for mid to late April. BG is re-branding our line of supply tools. The name VIA TM (pronounced “vee-UH”) will debut with the 1Q VIA®, PN 9210Q, to be used with the new Diesel Induction Service.